Feeney, Inc., a leading manufacturer of high quality stainless steel and aluminum railing systems, has unveiled a Single Corner Post for its DesignRail® Aluminum Railing System with CableRail infill. The new offering lowers overall material costs by requiring only one post in corners instead of two while also providing a more open feel and view. Compatible with the DesignRail® Aluminum Railing System, the Single Corner Post by Feeney is specially engineered to withstand cable tension in both directions, and is pre-drilled with horizontal slots that allow cables to easily pass through a 90-degree corner. 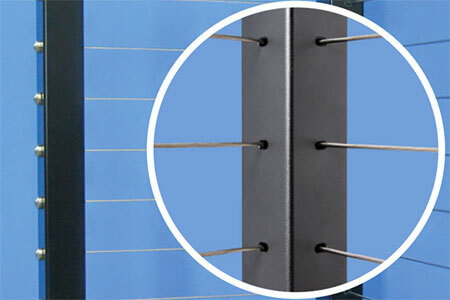 Feeney’s unique curved lacing needle enables installers to feed the cable through the post quickly, saving time on the job. The Single Corner Post is offered in standard DesignRail® heights, as well as custom heights, and for base mount, fascia and fascia bracket mount applications. It is available in all of Feeney’s Classic and Express Yourself DesignRail® colors.